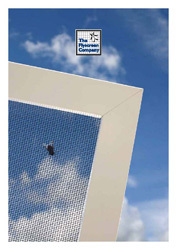 Our mesh can be used to prevent insects and rodents accessing eaves of rooves by restricting the open areas but maintaining good ventilation and air flow to the building. This mesh type is used in new build properties and as a retro fit. The soffit and cladding mesh we supply complies with EU standards and we can supply testing certificates upon request and can be ordered by the metre. Choose from our two main materials fibreglass and stainless steel and we will deliver the next working day as long as your order is placed before 1PM.